The 70:20:10 model for Learning and Development clearly establishes the need for L&D teams to focus on informal learning. In this article, I outline the significance of Performance Support Tools (PSTs) and how they can boost learning. 70% from on the job experiences (experiential learning). 20% from interactions with others (social learning). 10% from formal (structured learning). As we note from this model, organizations need to focus more on the informal and social learning aspects to effectively achieve their learning mandates. Let’s first understand what exactly Performance Support Tools (PSTs) are and why you should invest on them. What Are Performance Support Tools (PSTs) And How Can They Be Used? Why Does It Make Business Sense For Organizations To Invest On Performance Support Tools? If I were to ask you what you had for breakfast today, your reply would be an instantaneous one. It isn’t quite going to be the case if I ask what you had for dinner a month ago. We’re creatures who keep forgetting things! 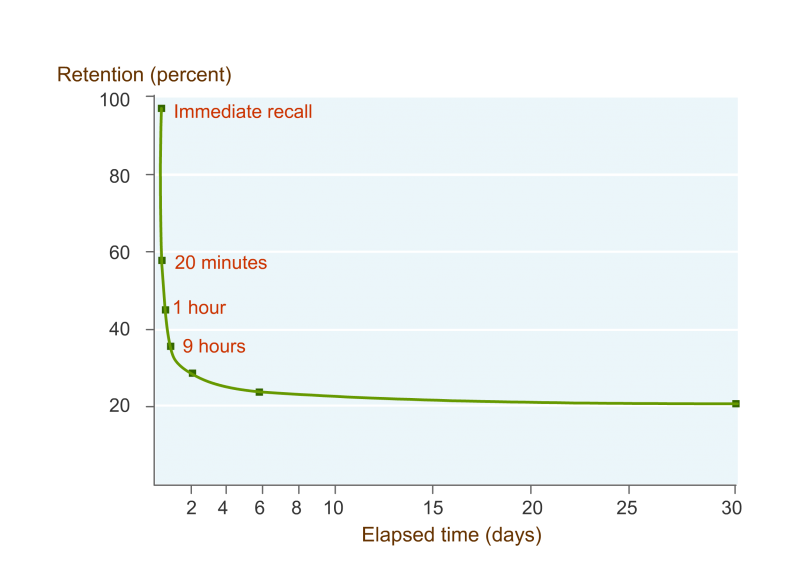 As a matter of fact, we forget 80% of what we learned in 30 days as shown in this diagram featuring the “Forgetting Curve” by Herman Ebbinghaus, a German Psychologist. Formal learning, as you may be aware, takes place for a few days in a year. Now view this from the prism of the Forgetting Curve and you’re bound to have second thoughts about your investments on using only formal training to make the kind of impact you’d like on your learner performance. A great way to address this challenge is to have a blend of both formal and informal training and offer a solution that treats “Learning as a continuum”. Ascertain the portions from your formal training program that you want your learners to remember, check, refer or apply, and use Performance Support Tools (PSTs) to reinforce those messages. Design your PST nuggets to be stand-alone assets aligned to specific learning outcomes. Weave your training nuggets into a “learning path” and keep the knowledge thread relevant and in appropriate order over the course of your identified training period. Combine the power of reinforcement with new assets for higher recall, retention, and application of the knowledge gained on-the-job. The result? You’ll be able to see a dip in your formal training costs and an increase in learner productivity and performance. How Do Performance Support Tools Help Learners? What Are The Possible Ways To Offer Performance Support Tools? Mobile Apps and just-in-time information go hand in hand. They are an ideal way to offer Performance Support at the time of learners’ need – anytime, anywhere. 2. Videos And Interactive Videos. If you had to unpack and start operating your brand new camera and you’re not sure how to go about it, what would you choose – leafing through the manual or a three-minute YouTube video? Most modern day learners opt for the latter. All the more reason for you to leverage on videos and interactive videos to offer Performance Support when your learners are stuck and need help! Learners keep encountering complex situations at work. You can make their life easier through short branching scenarios helping them practice their way out of tough situations and take decisions in a risk-free environment to bring about application of learning on-the-job. Animations and illustrations help you say things you would otherwise find difficult to convey. Their innate ability to incite the lighter side in your learners goes a long way in conveying important messages and long-term retention of that information. True, a picture speaks more than a thousand words. But you don’t need a thousand words every time to say what you want to say. Sometimes, just a few words do the job – especially when they’re set in motion and animated. If text is all you’ve got and the concept you want to convey is not that easy to visualize, Kinetic Text/Animation is what you should be looking at. You can club it with background music or a voice over and the impact will be there for you to see. Got information locked in lengthy documents? You can convert them into interactive PDFs, provide a user-friendly navigation, and add some visual appeal to please the eye. They’re a great format to help learners go through factual and knowledge-based information quickly and easily. Using this format, you can offer your learners tips, fact sheets, checklists, practical forms, participant guides, processes, and procedure documents. You can convert your documents into HTML5 compatible eBooks and make them multi-device compatible. They can also be converted as SCORM packages. You can package key information in your eBooks in the form of key takeaways from a training program, participant guides, processes, and procedure documents. 8. Expert Videos, Webinars/Recorded Webinars. Experts carry that aura around them, don’t they? Irrespective of whether it’s a classroom tutor, eLearning guide, or workplace mentor, learners treat them with respect and value their insights. You can offer Performance Support to your learners in the form of expert videos and videos of webinar recordings. You can also track your learners’ performance through assessments with SCORM packaging. These are short episodes of audio or video that learners can download on their device and watch/listen to when traveling, waiting for an appointment, or any other occasion to kill time. They find a lot of takers as they are brief and entertaining. You can use these formats to offer Performance Support at the time of learners’ need as they can be watched/listened to on-the-go. As we saw, the organizational learning strategy needs to focus on ways and means to enhance on-the-job learning. Performance Support Tools (PSTs) help you achieve this mandate. mLearning or mobile learning (by making PSTs in mobile-friendly formats). Designing learning for the millennial generation (innovative formats of PSTs can be aligned to the way Millennials learn). I hope this article provides you with the required insights on Performance Support Tools (PSTs) and why you should use them. Do contact me if you need any specific support to integrate Performance Support in your learning strategy.